Over the past couple of years, Kia has made everyone (ourselves included) take a second look at its brand by redesigning its entire lineup and offering impressive value. Now, the Korean automaker is doing it again with the newly-announced 2014 Kia Forte Koup, which offers -brace yourself –a turbocharged engine. 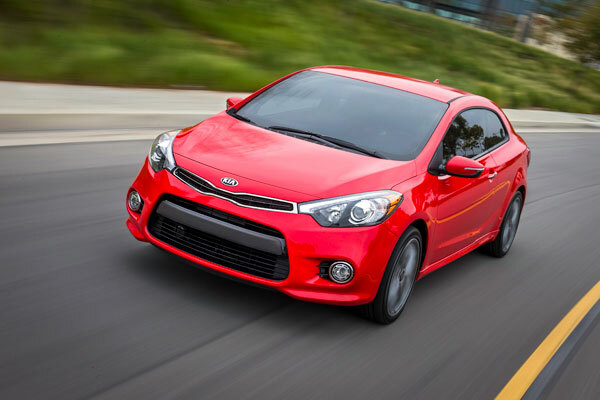 The Kia Forte Koup (yes, it’s Koup, not coupe) is entering its second generation in 2014, and Kia hopes the enhanced styling and all-new turbocharged engine will make a splash. The available 1.6-liter turbocharged, direct-injected four-cylinder generates 201 horsepower and 195 lb.-ft. of torque, and is the first such turbo engine for the Forte nameplate. The turbo engine powers the SX trim, making it the most powerful Forte Koup ever produced, but the 2.0-liter four-cylinder that powers the rest of the lineup is no chump either. The 2.0-liter engine produces a respectable 173 horsepower and 154 lb.-ft. of torque. If the redesigned vehicles weren’t enough to change your perception of Kia, will turbocharged engines like the one found in the recently-announced 2014 Kia Forte Koup do the trick?